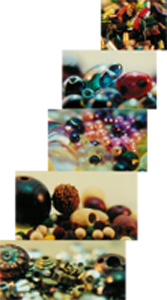 Beads have been around from over 40,000 yrs ago. They have been made from many different substances including gemstones glass, bone, horn, clay, paper, metals, shells, porcelain, wood, and ivory. The beads have always been made for adornment, status indicators, or religious purposes. In some places, beads used to play the role of money. The colloquial definition of ‘bead’ is commonly given as “anything with a hole that can be strung”. The bead itself is a dead part and becomes live as it finds its spirit "strung". The charm of beaded jewellery lies in its intricacy in carving, beautiful colors, different shapes, and the selection of the bead to suit the moment ,the occasion on which it is going to be wear. © 2007-11 www.mushkis.com. All rights reserved.